It’s not like it’s impossible to piece together a half-decent horror remake. As recent attempts like Dawn of the Dead, The Hills Have Eyes and The Texas Chainsaw Massacre demonstrated, in the right hands there’s plenty of scope to inject a modern spin without bastardising the memory of the original. But for most studios the primary motive for remakes isn’t to construct a meaningful update, but rather to squeeze a bit more dosh out of an idea that made them money once before. In the case of The Omen, 20th Century Fox had the added incentive that the movie could be rushed out for a much-hyped theatrical release on 6/6/06; because who doesn’t feel like a devil movie on a date like that, right? Aside from a cursory nod to September 11th and a couple of dream sequences, John Moore’s movie sticks pretty closely to the original template, with Ambassador Robert Thorn (Schreiber) slowly waking up to the fact that his dough-eyed adopted son may be the spawn of Satan. But what’s lacking here is any kind of wit, originality or energy in its own right. This is closer to paint-by-numbers than a movie – really, is there any point in this movie’s existence at all? Seeing that it does stick so closely to Richard Donner’s original, comparisons between the two are inevitable. And of course The Omen 2006 suffers in every way. Schreiber and Stiles make for woefully bland leads compared to Gregory Peck and Lee Remick (hell, they’d make woefully bland leads compared to Ant and Dec), and where the original deftly blended a measured sense of pacing with shocking set pieces, The Omen 2006 remains plodding no matter what devilish deeds are unfolding on screen. 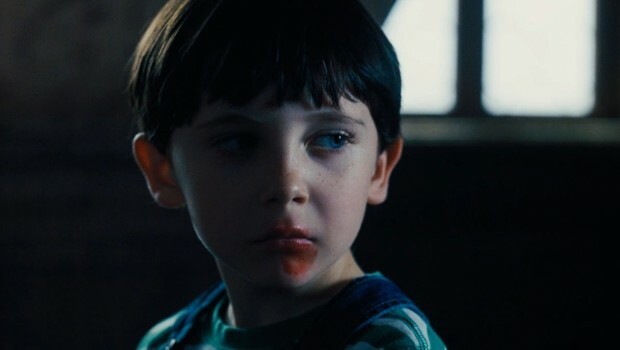 The Omen 2006 isn’t dreadful. It’s slick and efficient enough, there’s a decent supporting cast and if you haven’t seen the original then it might make for passable entertainment. But for anyone with fond memories of the 1976 classic, this update is less of a travesty than an entirely empty experience. It’s almost as if the Devil himself had a hand in sucking out its soul. There’s a reasonably informative commentary by director John Moore, a (mildly different) alternative ending and a featurette about the score should you care about such things. Pick of the bunch though is ‘Omenisms’, a rather odd ‘making of’ feature that’s shot through with creepy lighting and an ominous score – despite the occasional muffled sound, it actually creates a greater sense of unease than the movie itself. Then there’s a ludicrous documentary about the ‘unholy trinity’ of 666 and how these numbers spookily appear all around us in everyday life. The lowlight is a poker champion talking of how he once pulled out a hand of, like, three 6s. Chilling.